At the Passamaquoddy Lodge, St. Andrews NB on January 25, 2019, Mrs. Frances Gertrude (Ellis) Leighton of Pennfield NB and formerly of Oromocto NB, beloved wife of the late Clarence Elmer Leighton. Born at Saint John NB on August 12, 1925 she was a daughter of the late Mark and Gertrude (Sparks) Ellis. A loving mother, grandmother and special friend, she is survived by her son: Stephen (Carol) Leighton of Regina SK; two daughters: Donna Shanks of Fredericton NB and Susan Light of Miramichi NB; five grandchildren; several nieces, nephews, cousins and special friends: Millicent (Lester) McKay of Pennfield and Mona McDougall of Oromocto NB. Prior to her retirement, Frances worked several years as an office administrator for the Department of National Defense at Camp Gagetown. 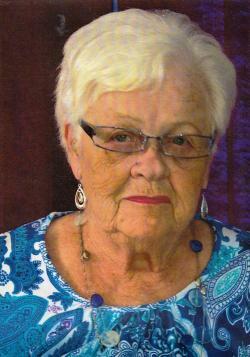 She was an avid card player and also enjoyed doing jigsaw puzzles. She will be sadly missed. Arrangements in the care of the St. George Funeral Home (755-3533) 26 Portage Street, St. George NB. In keeping with Frances' wishes there will be no visiting. A graveside service will be held at a later date at the Pennfield Rural Cemetery. In Frances' memory, donations to Charlotte County Cancer or to a charity of the donor's choice would be appreciated by the family.